what's so good about AAC Falls Creek? how do I go about joining? Guests and new members at ACC Falls Creek frequently comment on the friendly atmosphere. Most members go out of their way to make newcomers feel welcome and become part of the place. Children delight in staying in a lodge with other children to play with. They tend to spend time together in the games room while their parents enjoy adult company in the lounge/dining area. The Club takes pride in its range of members, young and old, with generations of members not uncommon. Most of our rooms allow for small groups of two or three, with other rooms accommodating four, five and six. Rooms for families of all sizes. AAC Falls Creek is at the entry to the village bowl, next door to the Falls Creek Hotel. When there's snow on the roads, it's a simple slide down the road to jump on Gully or International. The Home Trail takes you through the bowl and delivers you next door to AAC. If there is not enough snow on the road, then it's a very short walk to Summit or Eagle, or to download on Gully. It's even closer to the Village Shuttle stop. Ticket sales, ski & board hire, cafes and bars are all close-by in the village bowl. AAC Falls Creek is spacious, comfy and modern with fifteen guest rooms, accommodating up to fifty guests - a perfect base for winter snowsports and summer holidays in the mountains. Full adult members pay a non-refundable joining fee of $2,700 and buy a debenture for $4,000. The debenture can be sold to an approved buyer or transferred to a family member. Download full cost details. For a modest outlay of $6,700 you can enjoy a friendly home in the mountains. The AAC Falls Creek lodge underwent a major renovation over the summer of 2011/2012. This brought the building up-to-date with the latest building codes and bushfire regulations and increased the thermal efficiency with double-glazing and increased insulation. The busiest area, the lounge/dining room, was extended, recarpeted and re-upholstered with leather. The club was granted a new 50 year lease for the lodge. AAC Falls Creek is part of a larger group of similar Clubs, the Australian Alpine Club (AAC). 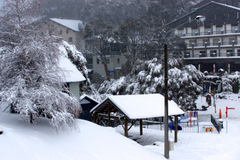 There are AAC lodges at Falls Creek, Mt Hotham, Dinner Plain, Perisher and also Niseko in Japan. 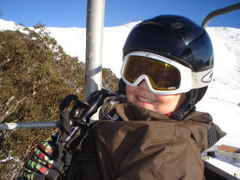 All AAC Falls Creek members have good access to these lodges and also reciprocal rights to other club lodges at Thredbo, Perisher, Charlotte Pass and Mt Buller. We encourage AAC members to stay across our network of Lodges, increasing the range of snow sports activities and meeting new people. The AAC also encourages Club competitions and has annual races at Club and National level, combining skill and social occasion. The AAC Falls Creek is not a commercial Lodge and is not open to the general public. Members and Guests understand that while there is a Lodge Manager, we tidy up after ourselves and help out if needed. We look after our friends and also our guests, in the one house for the time we are at the Lodge.